We hear about a woman with an artificial arm controlled by her mind, read stories about the creative potential of "right-brain" and "left-brain" people, and watch science fiction films featuring characters with implanted mind chips. Yet few of us understand the science behind these and other visionary advances being made today in brain research. Leading neuroscientists and scholars have charted the stream of new findings in Scientific American and Scientific American Mind, and their articles from the past eight years, compiled here in a comprehensive volume, offer diverse and provocative perspectives on various cutting-edge brain science projects. Consciousness and creativity are the focus of the "Mind" section, which features such compelling essays as science writer Carl Zimmer's examination of how the brain creates a sense of self. Steven E. Hyman, Harvard Provost and former director of the National Institute of Mental Health, proposes new ways of diagnosing psychiatric disorders in "Matter," a section that also features articles on psychological disorders, addictions, and other topics related to the interaction between body and brain. And "Tomorrow's Brain" reveals the intriguing future potential of man-machine interactions, as well as pioneering new methods of brain treatment. Eminent neuroscientist Floyd E. Bloom also contributes an engaging introduction that situates these pieces on the front lines of brain research. In today's technologically driven world, our lives are changing faster than ever, and neuroscience is becoming an integral part of that transformation. 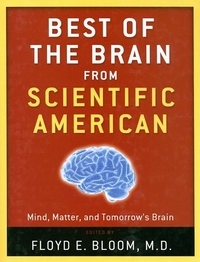 Best of the Brain from Scientific American gathers the very best writings on this sea change, providing an invaluable guide to the exhilarating possibilities of neuroscience.